Diamond polishing this is a natural process of polishing marble and other natural stone floors to replenish and restore the factory finish shine to the floor. 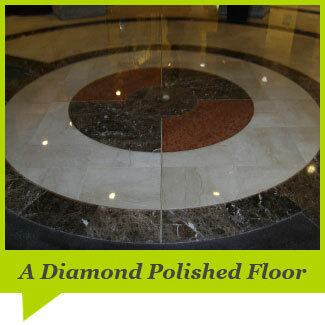 This is achieved by passing diamond abrasives normally starting with a medium grit diamond over the floor. This will remove light scratching, superficial scratches and minor etching. 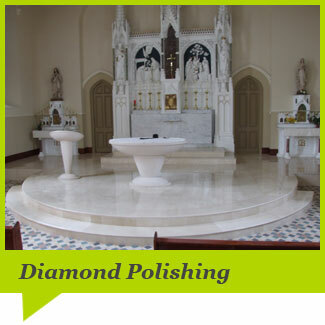 We normally employ diamond polishing as part of our nine stage programme for floor restoration which begins with diamond grinding, but where the floor condition affords it we often find that it is sufficient as a standalone treatment and enough to remedy tired and dull marble and natural stone floors. The system requires that progressively finer grit diamonds are passed over the floor. The general rule of thumb here is that the higher the diamond grit we finish with, the higher and deeper the polish that is achieved. Depending on the type of stone floor to be restored we employ a Planitorio fitment to the floor grinder which has a revolution speed of 1000 rpm to 2000 rpm. This technique requires substantial time in operation and considerable training and expertise on the part of the operator. The results of this system are that the floor has a mirror like factory finish or a beautifully honed appearance. As always we advise on the best and most durable finish to benefit the long term usage of the floor.